It seems like we just told you what everyone would be doing this summer, (check our our ultimate guide to Summer in Durham) but the end of the season will be here before we know it (September 22). Here’s what to make sure you’ve done before it’s over. The Durham Bulls games are a summer must-do, even if it means melting in the stands or on the hill while you enjoy Bull Durham Beer. Check out the promotional calendar for upcoming events, which include Bark in the Park, Friday Night Fireworks, $1 Concessions night and $2 Taco Tuesday night. We’re big fans of the bike shares around Durham, courtesy of Lime, Ofo, and Spin, and if you haven’t already, it’s time to jump on the bandwagon and find out what all the hype is about. Ride around downtown and check out some local shops! Whether you’re looking for a family friendly vibe or a millennial-centric patio, the city’s ever-expanding brewery scene has something for everyone. Some top picks: Bull City Burger and Brewery, Durty Bull, Fullsteam, Ponysaurus, Clouds Brewing, Barrel Culture, Beer Study. Hop on American Tobacco Trail for 22+ uninterrupted miles. It was once a railroad track that was converted into a beautiful trail for biking, walking, and running. You can even ride horses on the trail! Pro tip: No bike? No problem. You’re likely to find bike shares (Lime, Ofo, Spin and Mobike) along the trail. PLAYlist is Durham Central Park’s 10 week summer concert series with shows every Friday night from 6-8pm, rain or shine. And each show will have a great mix of local craft beer vendors and food trucks. Only 2 more shows left in August so don’t miss out! This summer you can catch free movies at various parks around Durham, with Rock the Park. Ponysaurus’s free movie series is a warm-weather staple. Nab a beer and some $1 snacks. This summer’s lineup, through September 16, includes Back to the Future, Die Hard 2, and Superman. Or you can beat the heat with the kiddos at Northgate Mall, the movie theater offers a summer movie series with FREE admission for parents and children to enjoy together. This time of year, there’s nothing better than enjoying dinner and drinks on an open-air patio. BOTB Picks: Guglhupf, Namu, The Durham Hotel, Unscripted, Foster’s, Parts & Labor, Fullsteam, see them all here. Stop by Durham Central Park on Saturdays until August 25th for a free yoga class or start your day with a class on top of The Durham Hotel, $10 drop-in fee for locals. Let’s be honest, cider is amazing all year along but there’s nothing like a good cider by Bull City Ciderwork’s fire pit in the fall. Gear up for the coming season and get a flight to try 4 or 5 different ones at once. Be sure to check out our events calendar and subscribe to our mailing list below. We’ll send you a round-up once a week of things to do in Durham and the best places to eat, drink, and see. 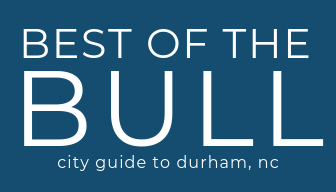 Plus get the guide to the best FREE Things to Do in Durham!